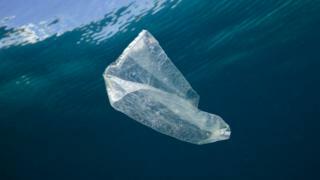 A study of litter in UK seas shows the number of plastic bags has fallen, amid a rise in other types of plastic rubbish. The authors say this could be due to several things - the introduction of charges for plastic bags across Europe, manufacturing changes and changes in ocean dynamics.The research found a rise in the proportion of fishing debris.Some of the plastic debris is likely to be coming from outside the UK.The reduced proportion of plastic bags in marine litter was found from 2010 onwards. There was a drop of around 30% from the pre-2010 period compared with afterwards. If charging is a potential contributor, the downward trend could suggest that policies can affect the amount and distribution of certain marine litter items on short timescales. But in their scientific paper, they add that this point is controversial.A change in the composition of plastic bags, which may speed up the rate at which they decompose, could also be another factor.Co-author Thomas Maes, who is a marine litter scientist at the government's Centre for Environment, Fisheries and Aquaculture Science (Cefas), said: "It is encouraging to see that efforts by all of society, whether the public, industry, NGOs or government to reduce plastic bags are having an effect. "We observed sharp declines in the percentage of plastic bags as captured by fishing nets trawling the seafloor around the UK compared to 2010 and this research suggests that by working together we can reduce, reuse and recycle to tackle the marine litter problem. "A UK levy of 5p per bag was introduced in 2015.The study, published in the journal Science of the Total Environment, looked at plastic debris on the seabed off UK coasts over a 25-year period. It compiles the results of 39 separate boat surveys that trawled for plastic between 1992 and 2017.Bags, bottles and fishing related debris were commonly observed across all areas. There was no significant trend over time in the percentage of seafloor trawls that contained any plastic litter or in the total plastic litter items found across the long-term datasets.However, statistically significant trends were found for fishing debris such as nets and lines. The researchers suggest that better training and action by the industry could help reduce the amount of fishing-related items found on the sea bottom.